Nonionic detergents are used for equipment cleaning to protect the product quality in pharmaceutical manufacturing. There are different types of detergents such as anionic detergents, cationic detergents, amphoteric detergents, alkaline detergent etc. This nature of the detergent depends upon the nature of the surfactant found in the detergent. These all have their specific use due to their cleaning properties. 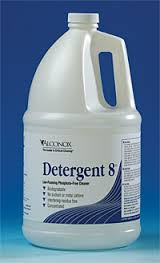 All of the above detergents have free ions and these are left after cleaning the cleaned surface. A mixture of nonionic and anionic detergent is found to be an anionic detergent. These free ions can have a harmful effect on the pharmaceutical products and affect their stability. Therefore, nonionic detergents are used for cleaning of equipment in pharmaceutical manufacturing. Nonionic detergents are also required to clean the glassware used in the pharmaceutical analysis because these free ions can alter the results of the analysis. These are prepared by the reaction of molecules containing hydroxyl groups like alkylphenol and ethylene oxide. This reaction is an exothermic reaction which generates heat. Ethylene oxide is very toxic and explosive in nature. Therefore, these are synthesized carefully in special equipment. Nonionic detergents do not ionize when these are dissolved in water. These are manufactured using the same quantity of acids and bases of the same strength and don’t have the acidic or basic nature. Therefore pH value remains neutral. These detergents make less foam than cationic or anionic detergents when used with water. Due to this property, these can be cleaned easily from the equipment surface. These are very much effective against the oily material. Generally, these pharmaceutical detergents are found in liquid form.